Doug Schoen looks at the Tea Party and he finds "the most powerful and extraordinary phenomenon in recent American political history." The political elite ignore them at their peril. Doug Schoen looks at Occupy Wall Street and he finds a group with "values that are dangerously out of touch with the broad mass of the American people." The political elite embrace them at their peril. A new Time poll shows that that 54 percent of respondents have a view of Occupy Wall Street that is "very or somewhat favorable," and that 27 percent of respondents have a view of the Tea Party that is "very or somewhat favorable." Yet Schoen, a pollster, would have President Obama court the group that a majority of people dislike and shun the group that a majority of people like. Okay, I know it's actually more complicated than that. Obama is a Democrat, and he has more to gain with independents in 2012 if he plays against type. That's the theory, anyway. But lets get real. The Tea Party and Occupy Wall Street are both movements that appear to have, within their ranks, more than the usual number of outliers. There's even a little overlap! Both groups hate the Wall Street bailout, and elements within both groups would like to abolish the Federal Reserve. Both groups are clearly the product of bad economic times. But Schoen seems to think that outliers who oppose raising the debt limit deserve our respect while outliers who favor "opposition to free-market capitalism" deserve nothing but contempt. Much about Occupy Wall Street that puts Schoen's knickers in a twist makes perfect sense to me. He's appalled to discover that 65 percent of all the Occupy Wall Streeters "say that government has a moral responsibility to guarantee all citizens access to affordable health care, a college education, and a secure retirement--no matter what the cost." I'm disappointed it isn't 100 percent! What would be the point of occupying Wall Street if you didn't believe those things? Me, I'd want to add that it's our collective responsibility to meet such goals without bankrupting the nation, but then I'm not camping out in Zuccotti Park; I sleep in my own bed in Washington, DC. Seventy-seven percent favor raising taxes on the wealthy. All I can think is that the other 23 percent wandered off to get coffee. How wanting to raise taxes on the wealthy puts you out of touch with the American mainstream I couldn't guess. As I noted in an earlier post, 54 percent of Republicans and Republican-leaners recently affirmed in a Washington Post-Bloomberg news poll that they favored higher taxes on the wealthy (in that instance, those who earn more than $250,000). Yes, they're in agreement with our dangerously-out-of-touch president of the United States. 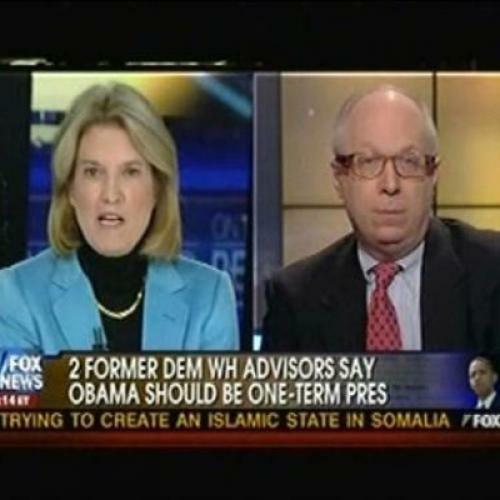 Why doesn't Schoen want Obama to "triangulate" with them?